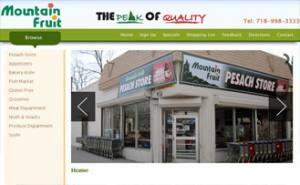 Brooklyn-based Mountain Fruit offers a wide selection of fresh food for the discerning kosher consumer. The new and improved Ecommerce website Bitochon designed for Mountain Fruit features innovative design, in-depth information and incredible deals and enables customers to browse and shop online using a credit card,debit card or paypal. All transactions are fully secure and protected on this website. Customers also can take advantage of weekly sale items via a Contact form and can provide feedback.